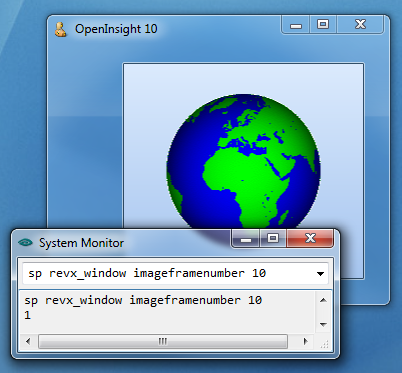 As we mentioned in our last post on High-DPI, the work needed to accommodate per-monitor DPI scaling in Windows 8.1 has also created the ability to scale OpenInsight forms to an arbitrary value outside of any system DPI settings. This new functionality is exposed via the SCALEFACTOR property described below. This is a number that specifies how much to scale the form by. A value of 1 means that the form has no scaling applied, a value of 1.5 scales the form to one-and-a-half times its normal size and so on. Note that the scale factor is applied after any scaling applied for system DPI. So, if your form runs on a 144 DPI monitor (150%) and has a scalefactor of 2 applied the actual scalefactor used is 3.0 (1.5 x 2.0). This specifies the minimum value that the ScaleFactor can be set to. By default it is set to “0.1”. This value can be set at design time. See the note on “Scaling Restrictions” below. This specifies the maximum value that the ScaleFactor can be set to. By default it is set to “5.0”. This value can be set at design time. See the note on “Scaling Restrictions” below. If this field is set to a value other than 0 it allows the ScaleFactor to be adjusted via the Mouse-wheel /Ctrl-key combination, or with a “pinch-zoom” gesture if running under a touch screen. The increment value controls the rate at which the form grows or shrinks. This value can be set at design time. In Example 3 above note the quality of the magnifying glass glyph on the buttons in the scaled form: it is much clearer and sharper on the Search button than it is on the Split button. This is because the Search button was designed using a “DPI Image List”, which means that an array of images, along with a corresponding array of DPI values, was specified for this glyph rather than just a single image. 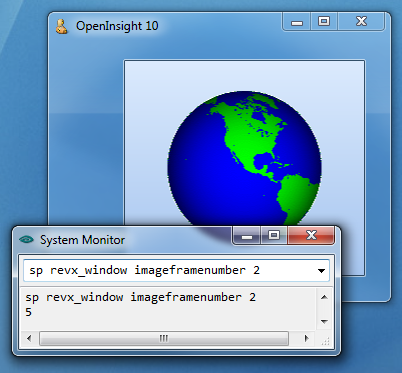 OpenInsight scans this DPI Image List looking for the closest match it can find when performing a scaling operation. By contrast the Split button is using a single image designed for 96 DPI and stretched to fit, resulting in a blurry appearance. (Note: We first mentioned this functionality in the section “Supporting images under High-DPI” in our original High-DPI post). Or course, you may also find yourself in the position of not wanting a particular image scaled, and in this case we’ve added a new property to the Image API called IMAGEAUTOSCALE. This is a simple boolean property that controls if an image is scaled by the system during the scaling process. It’s default value is TRUE. (We’ve also added a similar property to other areas of the system that use images as well, so there is a GLYPHAUTOSCALE property, a SPLITGLYPHAUTOSCALE property and so on). The minimum and maximum size that a form can be rescaled to can be restricted by the minimum and maximum window sizes as defined by the OS. 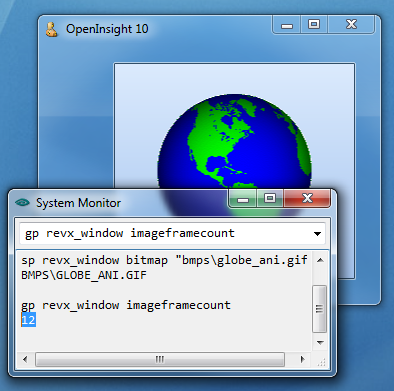 As a general rule this size is usually slightly larger than the size of the entire desktop across all monitors (See the GetSystemMetrics() Windows API function along with the indexes SM_CXMAXTRACK, SM_CXMINTRACK, SM_CYMAXTRACK, and SM_CYMINTRACK for more details). You can, however, override this behaviour if you set the TRACKINGSIZE property for a form, specifying values large enough to handle your desired scaling range. In our next post we’ll take a look at the new SCALED event and discuss how to interact with the system during a scaling operation. This entry was posted in Presentation Server and tagged DPI, Images, Properties, WINDOW on June 2, 2014 by Captain C.
This entry was posted in Presentation Server and tagged Controls, EDITLINE, Images, Properties on April 18, 2014 by Captain C.
Perhaps one of the controls most in need of a face-lift in OpenInsight is the Button (a.k.a PUSHBUTTON) control, and in this post we’ll take a look at some of the new features we’ve added to it for version 10. Of course you don’t have to supply all of these images – the system will attempt to pick the closest match based on the IMAGECOUNT supplied. Access to the image properties is exposed via the normal Image API with the exception of the IMAGENUMBER property which is managed automatically depending on the button state. 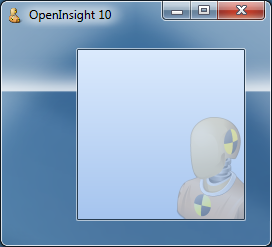 One of the biggest drawbacks with using buttons in previous versions of OpenInsight is that images have only ever been applied to the background as a whole. In order to create a button with an icon (or glyph, as we’ll refer to it henceforth) it has always been necessary to provide an image file with the entire button background drawn on it as well as the required glyph and text. This makes it very difficult to provide a solution that looks good across different color schemes and visual styles, and it also makes any sort of runtime customization problematic too. “3” – Glyph to the bottom, text to the top. This property is simply the number of pixels between the glyph and the text. Flat “toolbar” style buttons are supported by the boolean FLAT property. I.e. 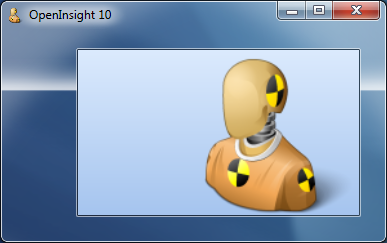 the actual background is not painted until the mouse is moved over the button. 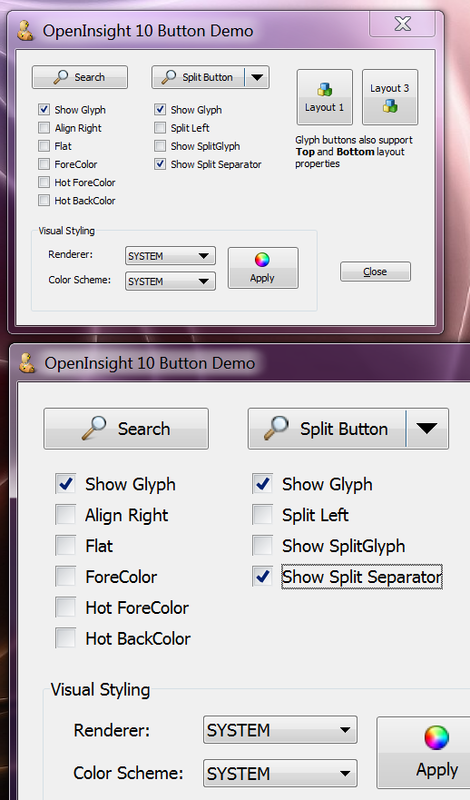 The button BACKCOLOR property fully supports custom colors and generates a set of matching 3D highlight and shadow colors to use when rendering. The FORECOLOR property also makes a welcome return and is now respected regardless of the visual style in use. It also supports the new MOUSEOVER event so you can easily track mouse movements without having to resort to using WINMSG events. A TEXTORIGIN property is provided that allows you to specify the exact XY position that you wish the text to be drawn at in a similar manner to the GLYPHORIGIN property. Horizontal text alignment is also supported by the TEXTALIGN property. 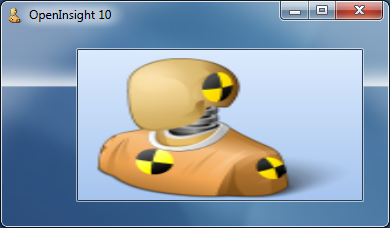 This entry was posted in Presentation Server and tagged Controls, Events, Glyph, Images, Properties, PUSHBUTTON on July 26, 2013 by Captain C.
“0” Clip – the image is not resized and is simply rendered onto the client area according to the IMAGEALIGN property (Note that the IMAGEORIGIN property will override the image alignment). 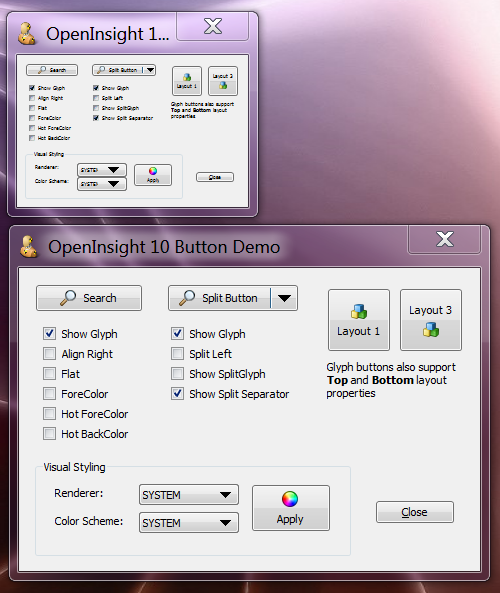 “1” Stretch – the image is resized to cover the entire client area of the window. “2” Tile – the image is tiled across the entire client area. “3” Scale – the image is resized but it’s proportions are kept constant: e.g. if the image is taller than it is wide the image height will be resized to the height of the client area, and it’s width scaled to keep the same proportions. It will also respect the IMAGEALIGN property. This property specifies the color to use as the transparent color when rendering the image as described in this post. It basically replaces the current (and undocumented) IMAGETRANSPARENT and TRANSPARENTCOLOR properties, both of which have been deprecated with this release. “-1” Use the color of the top left pixel as the color-key. “-2” Use the color of the top-right pixel as the color-key. “-3” Use the color of the bottom-left pixel as the color-key. “-4” Use the color of the bottom-right pixel as the color-key. “-5” Do not use any color-keying. Some image formats such a GIF and TIFF files can contain more than one image, held in series of frames. This read-only property returns the number of frames in the image file. Note that this is not the same as the IMAGECOUNT property, which applies to a single frame only. This property gets or sets the current display frame for the image and could be used with a TIMER event to display an animated GIF file for example. Note that this property is not the same as the IMAGENUMBER property which applies to a single frame only. Note that for a multi-frame image format it returns the size of a single frame, not all the frames combined. This property specifies the transparency of the entire image as it is rendered onto the window. It is based on simple percentage amount, “0″ being fully opaque and “100″ being fully transparent (and therefore not visible). This method supersedes the existing IMAGE property and allows a image to be set by passing the raw image data rather than by passing a file or resource name as per the BITMAP property. 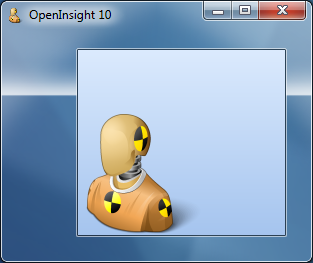 The OpenInsight property interface is text-based and does not support passing binary data with embedded null characters, whereas the method interface does, hence the reason for this change. IMAGE – this property has been superseded by the SETIMAGE method. It is now a synonym for the BITMAP property. IMAGECLIP – this property has been superseded by the IMAGESTYLE property. IMAGETRANSPARENT – this property has been superseded by the IMAGECOLORKEY property. TRANSPARENTCOLOR – this property has been superseded by the IMAGECOLORKEY property. This entry was posted in Presentation Server and tagged Images, Methods, Properties on February 7, 2013 by Captain C.
A much better alternative is to use an image format that supports an “alpha channel” such as a PNG file*. Basically this means that each pixel in the image has an extra byte that describes it’s transparency – a value of 0 means that the pixel is totally transparent, while a value of 255 means that the pixel is totally opaque, Values in between are used to calculate how the image pixel is combined with the background pixel when drawn, so that it gives the appearance of being translucent, allowing the background pixel to show through to some degree. This is a technique known as Alpha-blending. Note that this effect also applies to color-keyed and non-transparent bitmaps too, which of course are still fully supported so you won’t need to change your existing applications unless you want to. 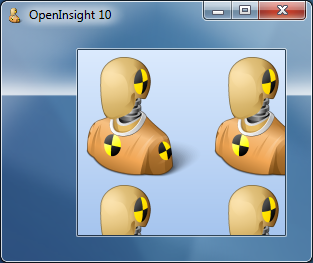 In the next post we’ll take a look at some of the new image-specific properties that support this functionality. 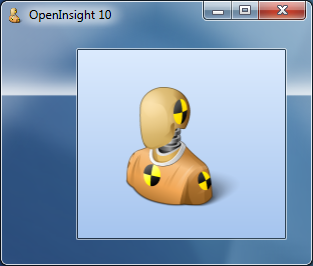 * (PNG image files have always been supported in OpenInsight but the alpha-channel has never been respected, thereby limiting them to basic color-keying for transparency effects). This entry was posted in Presentation Server and tagged Images on February 1, 2013 by Captain C.
16-bit and 32-bit versions of OpenInsight have historically used a 3rd party library (ImageMan) for handling various image formats, mainly due to the lack of inbuilt support in Windows itself when the OpenInsight tool-set was first developed. More information on the WIC can be found here. This entry was posted in Presentation Server and tagged Images on January 23, 2013 by Captain C.